WINDSHIELD HINGE LIGHT BRACKET PAIR, BLACK, 76-95 WRANGLER - Jeep Parts Guy - All the Jeep Parts You Need! Easily and quickly mounts to your factory windshield hinge creating two great spots for offroad lighting. 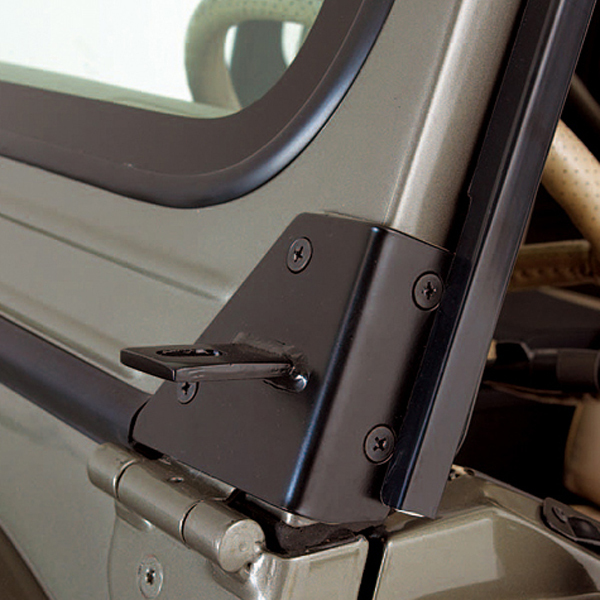 Special design wraps around the windshield hinge creating a tight rattle free fit. No drilling required for installation. Sold as a windshield hinge creating a tight rattle free fit. No drilling required for installation. Sold as a pair with all mounting hardware.